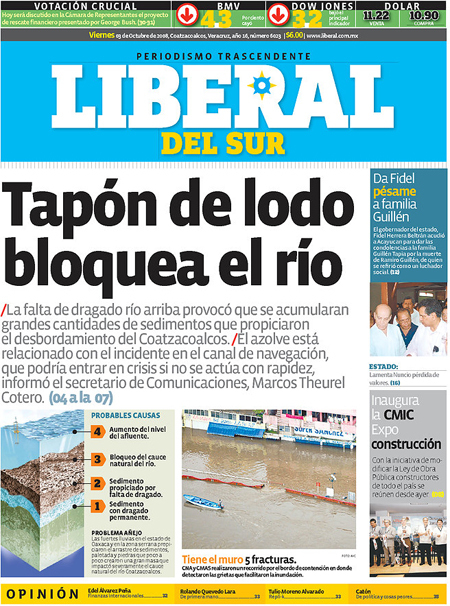 Above: Diario Liberal del Sur, from Coatzacoalcos, Mexico. The website maintains many of the printed typographic accents. Or is it the other way around? Check in with Newseum daily. Front pages and links to newspapers around the world. This entry was posted by Erik Brandt on Friday, October 3rd, 2008 at 8:38 AM	and is filed under Aktuell, Globalization, Graphic Design, International, News Links, Typografika, Typography.